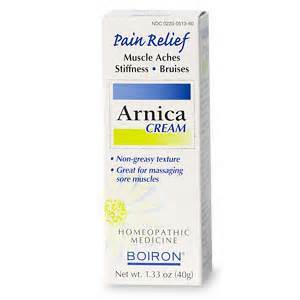 #1 homeopathic remedy that is used first for all sports injuries and trauma injuries! Soft tissue swelling and pain. Bruised feeling at the site of the tendonitis. Often result from injuries related to a sudden blunt trauma or sudden strain. 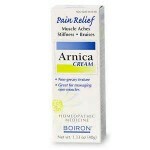 Also buy and use as a Arnica Montana cream, topically in additional to dry or water dosing. Injuries from overuse of muscles and exertion. Pain to the area from inflammation is a burning or bruised sensation. Used after a sprain or injury to a tendon is a feeling of restlessness. Initial movement of the joint is painful, but with continued activity, the pain eases. Tendinitis that results from overuse or from an injury from repetitive stress. Also used for tennis elbow. Injured area is painful on first motion if movement of the joint but but pain is better with continued activity. Pain is better with massage and gentle motion. Pain is better with heat. Pain is a bruised or beaten feeling. Pain at the area where the muscle meets the bone. Similar to the symptoms of Rhus tox. Inflammation is worse from cold air or applications. Pain is worse in wet weather. Pain is relieved by motion, or activity of the affected part like with Rhus tox. Use if tendinitis is slow to heal or when there are hardened masses in tendons with contractions of the flexor muscles.